Recorded February, 2, 1991, Radio Studio DRS, Zürich. seit vielen Jahren vergriffenen Platte, Study II als Erstveröffentlichung. «Die Geschichte von Barry Guys Jazz Composers Orchestra beginnt 1970 mit Ode, dem ersten Manifest dieser neuen Art individuellen/kollektiven Zusammenwirkens im Schnittbereich von strukturierender Einflussnahme und improvisatorischer Freiheit/Ausgestaltung. Zehn Jahre nach dem in stilistischer Hinsicht pluralistisch angelegten Anfang entsteht ein Werk, dem gleichfalls signifikante Bedeutung zukommt: Stringer. Das Orchester hat seine Klangsrache gefunden. Die Spieler atmen die neue Freiheit in unterschiedlichen Spielkonstellationen, solistischen Höhenflügen und kollektiver Komplexität. The history of Barry Guy's Jazz Composers’ Orchestra begins in 1970 with Ode, the first manifesto of this new way of individual/ collective collaboration at the interface of a structured intervention and the freedom of improvising. Ten years later, after from a stylistic point of view pluralistic beginnings, a work of equal significance has been created: Stringer. The orchestra has found its language, The musicians breathe the newly gained freedom in different playing combinations of solo high points and collective complexity. From Ode through Stringer we move on to Study in another ten year leap. 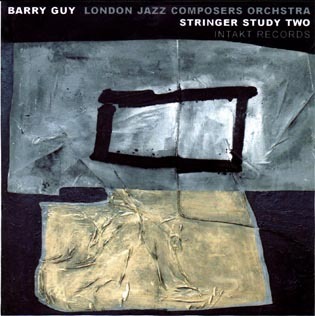 Even less than before, Barry Guy measures himself against historic forms or current conventions. He creates a complex process of events from a simple structure, a work which unfolds out of, and in the end sinks back into, silence. One could make associations with ethnic music cultures and John Cage's idea of music. What really happens is defined by the interrelationship between this new type of composer and the musicians involved.